Here are Cloud 66 we are all about making developers life easier. That’s why last week we released automatic server monitoring for all our awesome customers. 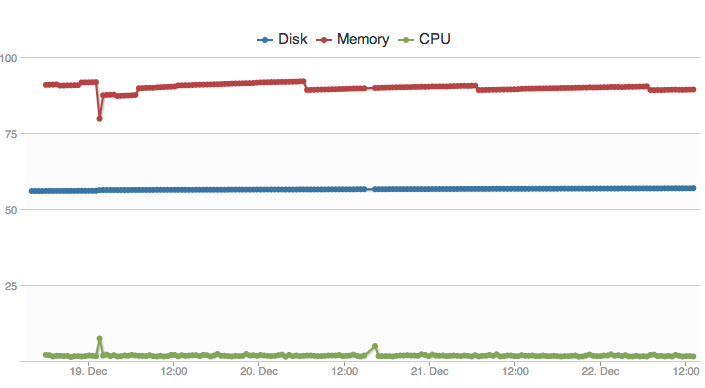 Any server deployed and managed by Cloud 66 is now monitored for CPU, Memory and Disk space. You can see this data as a chart on your server page. We collect these vital signs every 30 minutes and keep them for 1 week. This helps you to have peace of mind about the health of your servers and apps. Also all the processes running with Procfiles are monitored for their state and any failing or crashing ones will be restarted automatically. As always, with Cloud 66 your apps run on your own servers and you always have full shell root access to your servers. So if you need more advanced monitoring like Nagios, you can always do it the way you like it without loosing any of Cloud 66 benefits.